"Sampath Speaking" - the thoughts of an Insurer from Thiruvallikkeni: Emu runs on road in Barcelona - is killed accidentally ! Emu runs on road in Barcelona - is killed accidentally ! Sure none of us would recognize ‘genus Dromaius’ - the largest bird native to Australia and the only extant member of the genus – unless we know its common name ‘the Emu’. It is the second-largest extant bird in the world by height, after its ratite relative, the ostrich. Emu is common over most of mainland Australia. They have long thin necks and legs. Emus can travel great distances at a fast, economical trot and, if necessary, can sprint at 50 km/h (31 mph) for some distance at a time. Is it a distinct trait of the State – to get lured by fast promises, put all their money and then cry hoarse when they are cheated ? - Why don’t people realize that ‘you can never get any unrealistic % of yield in any business’ and that one should only do the business which is known to them or atleast the one which they can understand – and not leave things to others and then blame the others for not paying ! What else and how can people wait – they went in large numbers lured by the advertisements in Coimbatore, with no exception in Krishnagiri, Pollachi, Mettupalayam, Tirupur, Perundurai, Dharapuram and Salem – all dreaming it to be a viable option. The farms and vacant lands were soon turned to Emu farms with security deposit and investment raised either from farm money or by loans at a high % of interest. ~ Public memory is so short that they perhaps have forgotten in 5 years. Those were the days when people from Agriculture, to Spinning and textile mills – all requiring knowledge and labour, got lured and ran after Emu rearing believing it to be an easy paying option and shortly reality slapped them on face .. the economies of scale also hurt – as reportedly the meat price came down heavily with more emu meat available in the market. The oil processing and other industrial ventures would remain only in newspaper advertisements. It was a bubble waiting to burst ! – people have invested in cine-field; finance companies termed as ‘blade companies’; multi-level marketing not selling any product but asking them to enlist more people in chain; and many other similar activities. It was the turn of thousands of farmers, to get lured by private firms – and they promptly lined up, queuing up to invest in emu farms in Salem and Erode in the hope of making a quick buck, investing life savings or borrowing money to start a business. Within a few months, farmers started complaining that they were suffering losses and were being cheated. There had been advertisements in television channels and newspapers offering freebies and mentioning ‘rag to riches’ stories and people started investing without knowing ‘what Emu was’ and the ‘nuances of Emu farming’. They got carried by empty prattles of some Firms offering the chicks and buying the same back at a higher price after a few months !! - they believed that emus would grow big, inturn making them richer, which was not to happen………. They got carried by the offer of Emu Farms, demanding Rs 1.5 lakh as deposits and the promised return of Rs 6,000 per month for three years and – as a freebie, a gold coin. .. .. .. and more easily gullible with star actors who preach wisdom in their speeches endorsed this product. Emus use their strongly clawed feet as a defence mechanism. Their legs are among the strongest of any animals, allowing them to rip metal wire fences. They are endowed with good eyesight and hearing, which allows them to detect predators in the vicinity. The plumage varies regionally, matching the surrounding environment and improving its camouflage. Males and females are hard to distinguish visually, but can be differentiated by the types of loud sounds they emit by manipulating an inflatable neck sac. 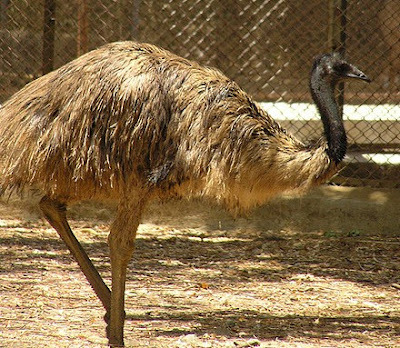 It was claimed by the sellers that Emus are raised throughout the world, can adapt to a variety of conditions ranging from the cold winters to the extreme heat and that they live up to 40 years. In a first of its kind case in Tamil Nadu, well known Tamil actors Sarathkumar and Sathyaraj, both brand ambassadors of Susi Emu Farms in Perundurai reportedly were booked on charges of “criminal conspiracy.” The film stars had appeared in advertisements endorsing the fancy schemes of the firm which later defaulted several crore rupees due to thousands of depositors from various parts of the State. Emu after all is a flightless bird – but can run much faster, performing the vanishing act along with the money invested on it. Elsewhere in Barcelona, the emu was not lucky – as Spanish police accidentally killed an escaped emu after chasing the animal through the streets of a Barcelona commuter town. The emu reportedly died 'from stress' after being followed by police on motorbikes, who later pinned it down on a street corner. MailOnline posted a video and news item showing the panicking bird run down a one-way street in Sant Cugat del Vallès, a town some 12.5miles north of Barcelona on Wednesday afternoon. Police officers chased down the escaped emu in motor cycles. It is not known where the emu may have come from, but it is possible it escaped from a farm or an animal park. Local animal right activists have asked the local council to investigate where the animal came from and if the owner had the legal right to keep the emu. Police officers not so well trained for such oddities, managed to chase it down and brought it down holding its neck but in the melee, the flightless bird succumbed to what was reported as ‘mental stress’. 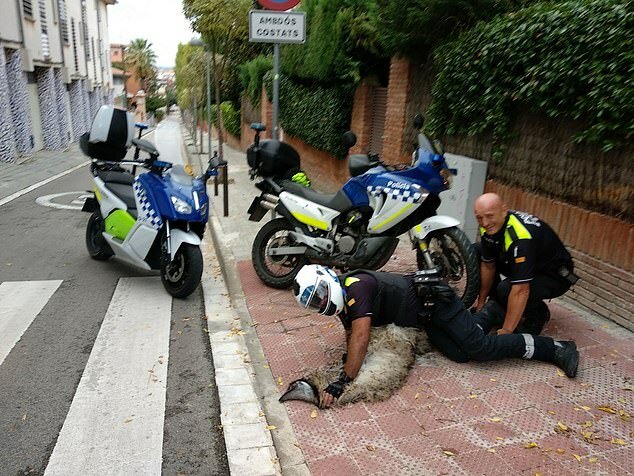 Representatives from the Animalist Party Against Mistreatment of Animals [PACMA] questioned what an emu, which is native to Australia, was doing in the Barcelona commuter town. It also demanded that local police receive training in how to safely capture and retrieve escaped wild animals which may not naturally occur in the area.